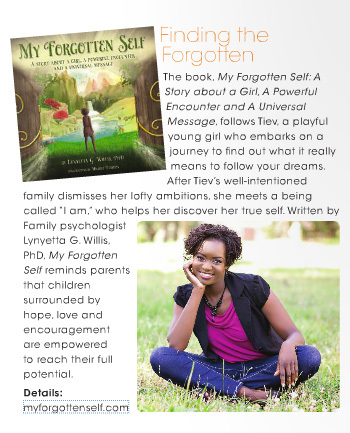 "​My Forgotten Self​ is a beautiful reminder to adults and children alike, about the divine qualities we all possess inside of us. It will help children connect to all that life has to offer from the inside out so they can grow into healthy, fulfilled adults, that will shine their Light onto the world." ​"Exquisitely illustrated, My Forgotten Self, reminds children of their inherent knowing of who they are and the life purpose they have been born to fulfill. Read this book to your children and watch how their soul-memory awakens--inviting you to welcome and nourish it. What a gift to parents, caregivers, and adults, who are in a position to encourage a child's self-trust and inner fulfillment. My Forgotten Self has received first place for the 2016 Purple Dragonfly Award ~ Picture books, children 6 and older. Awarded to books that "inspire, inform, teach or entertain children. Dragonflies are reminders that we are light and can reflect the light in powerful ways if we choose to do so." My Forgotten Self was given the highest 5 STAR RATING by Readers' Favorite Book Review. "​[My Forgotten Self,]​ a beautiful reminder to enter our true self and remember to hear the essence within!" ​"Tiev is the little girl in all of us who are still questioning our gift to humanity. We too can find our answers when we become still and go within. Lynyetta has found a way through a child's heart to teach teens and adults alike." "Authors send me oodles of multicultural children's books and I try my best to read them all. When I opened the package with ​My Forgotten Self in it, not only did this book take my breath away, it made my eyes leak! I was absolutely thrilled to read it to my 10-year-old daughter." "...a beautiful story with lovely illustrations that teaches we are all important. This is a powerful message that needs to be shared frequently. My Forgotten Self speaks to all of us about the earthly treasures that we are given: ourselves, our bodies, and our ability to do so many things." "I was gripped by the stunningly beautiful story and images of My Forgotten Self. The universal messages of self-acceptance, courage, and discovery are just right for girls and boys of many cultural backgrounds and faith traditions. As a psychologist and parent, I am excited to add this to our family's library!" “Very sweet and uplifting. Your message is inspiring and the illustrations are charming. Very well done. "My Forgotten Self reminds us that no matter what others say, there is a power within us that gives us all we need to follow our dreams and desires. This is no average 'you can do it'​​ picture book -- this is a moving story that deeply inspires, touches, and encourages the treasure that is our true, sometimes forgotten self." "Beautifully illustrated and carrying an important message, My Forgotten Self is an inspiring reminder of how beautiful a treasure each one of us is. Share it with someone special in your life!" “Our children are born into a world of infinite possibilities but many times spend their formative years experiencing well-meaning adults who don’t want them to get hurt and thus use the words, 'you can’t.' My Forgotten Self by Lynyetta Willis is a wonderful teaching tool that helps our children remember that with God, ALL THINGS are possible. It reminds the young and old reader alike that God, as creativity will not be stifled by human limitation and fear. It also reminds us that each of is a treasure of God’s creativity and are unbound expressions of love. This delightful children’s book is a visual masterpiece with illustrations beautifully created by Michele Phillips that delight the eye as Dr. Willis's words inspire the soul. I plan to read it to my granddaughter as a wonderful reminder of her limitless ability to partner with the God of her very existence." ﻿ "Do not let others define what they did not create. You are a Treasure. Cover of "My Forgotten Self"